The boys were back in town for a Saturday night spin around the Dukedome. And they had some pretty recognizable names providing the opposition. 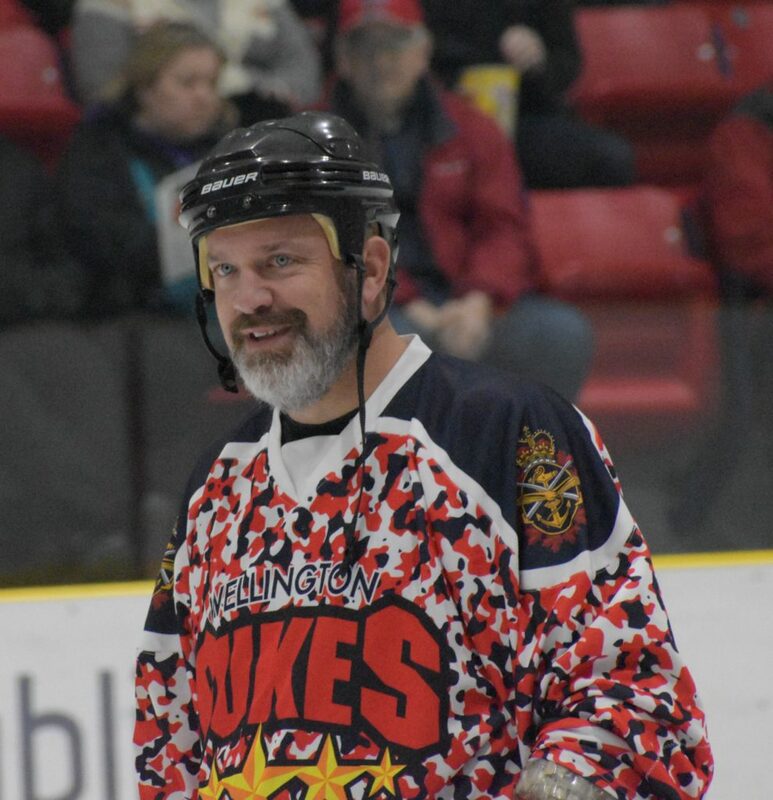 Around 700 people showed up at Lehigh Arena for what seemed like Hockey Night In Canada as the Toronto Maple Leafs Alumni did battle with Wellington Dukes of recent and past memory. Of course, ‘battle’ being a relative term when it comes to the high jinks that accompany such alumni get-togethers but there were certainly moments where the end-to-end action was spirited, the strides brisk, the shots heavy and the passes crisp. The score would wind up being 11-9 in favour of the Maple Leafs. The Dukes managed to build a nice lead in the first 20 minute stop-time period thanks in part to goals by Mike Senior and Steve Cooke and were ahead 5-3 with under three minutes to go but a three goal eruption by Toronto capped off by a Dave Reid wrister from the slot with five seconds to go put the Leafs ahead 6-5. The trio of hockey Hall of Famer Doug Gilmour and his sons Jake and Tyson who is a current Wellington Duke took over in the second of two periods and the line combined for a couple of goals. Chris Brown (2), Kessje Kort and Mark Runions and Cooke had goals for Wellington in the second half of the game. But more than the score, it was a great reunion weekend for the Dukes alums, many of whom only had memories of skating in the Niles st. Bandbox and walked into Lehigh Arena for the first time on Saturday night. “It’s been a great night for the organization and the alumni,” Wellington Dukes Director of Marketing and Sales told the Gazette as the players from both sides milled about on the ice during the post game celebrations where members of the Leafs alums tossed t-shirts into the crowd. 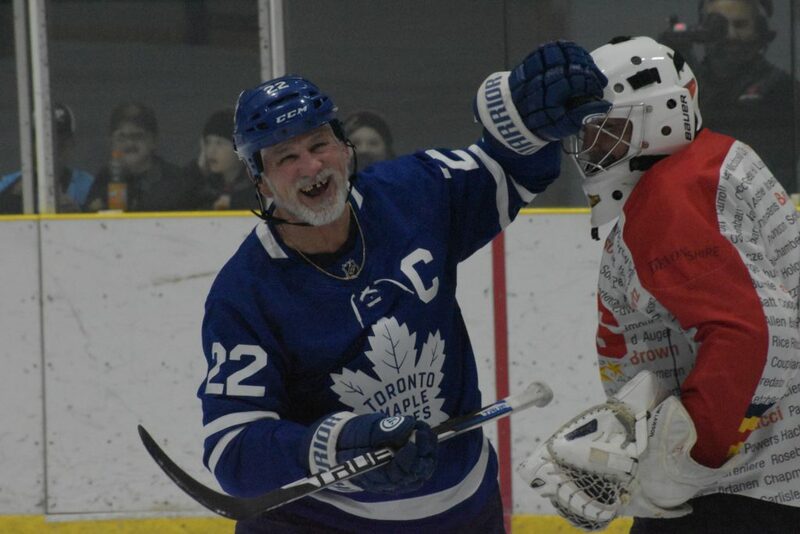 About the only down side to the game was that former Leafs captain Wendel Clark was a late scratch and didn’t come to Wellington Saturday. 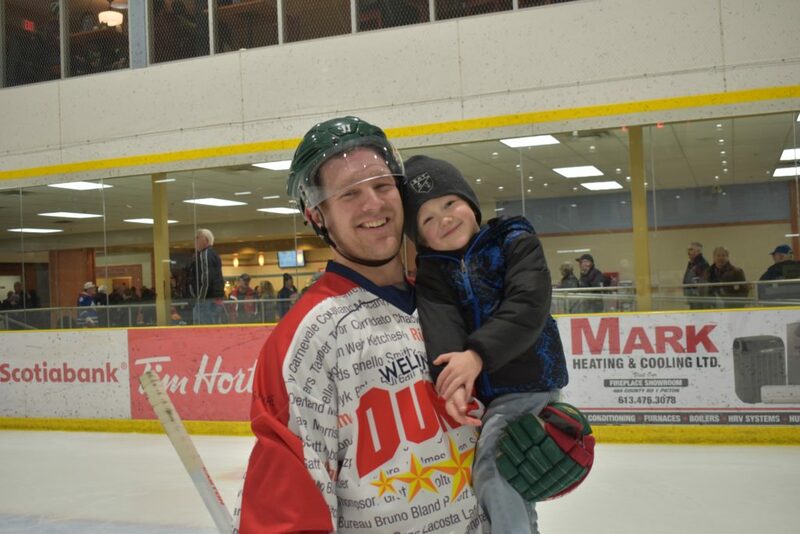 But local hockey fans in attendance on Saturday that missed their chance to cheer on the Kelvington, SK native will be able to attend the Dec. 21 Wellington Dukes game for free and visit with #17 and get an autograph. “Wendel was disappointed he couldn’t make it here tonight but he will be here on Dec. 21 so those fans with a ticket stub tonight can come to our game against Kingston and meet him here at Lehigh Arena,” Davies added. Replacing Wendel and former Leaf Greg Hotham on Saturday night were certainly now slouches in the forms of Shayne Corson and Laurie Boschman. One of the many former captains in the lineup on Saturday night for Wellington was native Kingstonian Damien Gilbert. 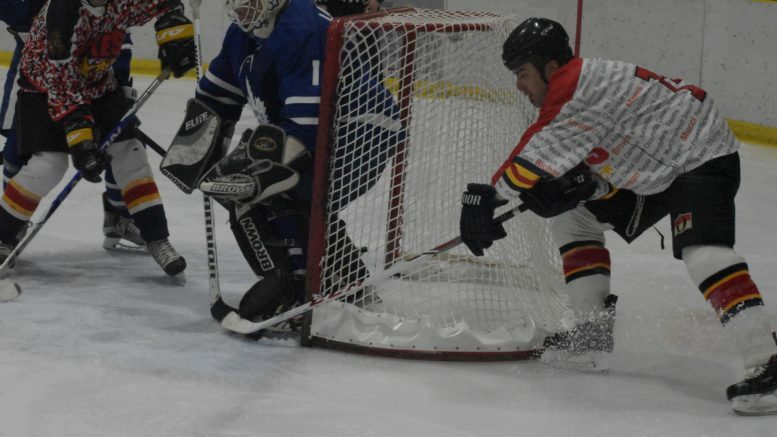 The blueliner played three seasons in the mid-1990’s in Wellington when late General Manager Garry Lavender was starting to ramp up the Junior A incarnation of the hockey club. ‘Sparky’ was a well rounded rearguard that played a tough brand of hockey, could contribute offensively as evidenced by his 91 points in 126 Jr. A games in Wellington uniform. Gilbert would go on to graduate from PECI and play three seasons for Queen’s University in Kingston where he now serves as CEO of Caduceon Laboratories. Playing Saturday night, Gilbert admitted Garry and the Lavender family as well as his billet Jim Dunlop were not far from his thoughts. Jeremy Franklin was one of the best to ever wear the Wellington uniform and was a favourite of former Coach Marty Abrams as the Bath native would light the lamp 102 times in four season in Wellington. Frank, as he was known during his time here, thanked the organization for the opportunity to play against the Maple Leafs alumni at Lehigh Arena.